The Tadpole nebula is looking very stylish in this new infrared image from the WISE spacecraft, NASA’s Wide-field Infrared Survey Explorer. An asteroid appears like a string of pearls — seen as a line of yellow-green dots in the boxes near center — in this stitched together mosaic. The Tadpole is a star-forming region in the Auriga constellation about 12,000 light-years from Earth. As WISE scanned the sky, it happened to catch asteroid 1719 Jens in action, moving across WISE’s field of view. A second asteroid was also observed cruising by, as highlighted in the boxes near the upper left (the larger boxes are blown-up versions of the smaller ones). More on this image below, but the WISE team received a bit of bad news this week. WISE principal investigator Ned Wright and his team had proposed a three-month “warm” extension of the mission after the supply of hydrogen that cools the telescope and detectors on board runs out. However, according to an article in Space News, NASA’s 2010 Astrophysics Senior Review Committee recommended that the mission not be extended, and end as originally planned in October of this year. While WISE is expected to produce significant results, the committee said there was not adequate scientific justification to continue the mission. The proposed additional three months, known as Warm WISE – where the spacecraft would observe in two of the four infrared wavelengths it has available when WISE is cooled –would have added $6.5 million to the program’s $320 million price tag. Currently, WISE produces approximately 7,500 images a day. It consists of twenty-five frames, taken at all four of the wavelengths and were combined into one image: infrared light of 3.4 microns is color-coded blue: 4.6-micron light is cyan; 12-micron-light is green; and 22-micron light is red. But wait, there’s more! Also visible in the image are two satellites orbiting above WISE (highlighted in the ovals). They streak through the image, appearing as faint green trails. The apparent motion of asteroids is slower than satellites because asteroids are much more distant, and thus appear as dots that move from one WISE frame to the next, rather than streaks in a single frame. This Tadpole region is chock full of stars as young as only a million years old — infants in stellar terms — and masses over 10 times that of our sun. It is called the Tadpole nebula because the masses of hot, young stars are blasting out ultraviolet radiation that has etched the gas into two tadpole-shaped pillars, called Sim 129 and Sim 130. These “tadpoles” appear as the yellow squiggles near the center of the frame. The knotted regions at their heads are likely to contain new young stars. 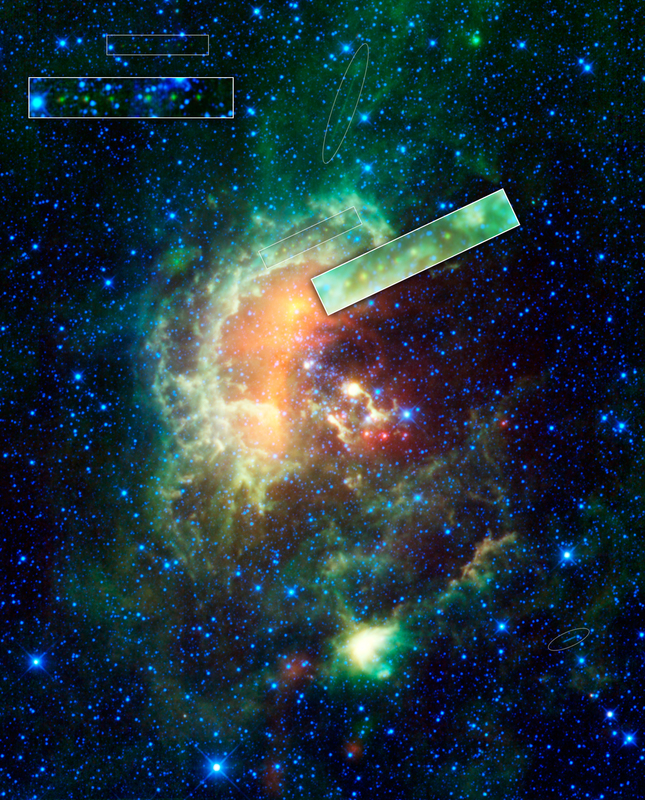 WISE’s infrared vision is helping to ferret out hidden stars such as these. I recently heard the Herschel Space Telescope’s team members explaining away the 3 year life of the cryo-cooled Herschel Space Telescope…. They lamented the expected loss but were planning ahead for reduced sensitivity observations. JOB OPPORTUNITY – Functional autonomous satellite tender/tanker wanted for multiple transorbital operations. Ion engine, solar sail or plasma engine propulsion considered. Must have cryogenics replenishment capability and launch using a medium lift booster. Fuel and consumables may be launched separately to refuel on orbit tender/tanker a/r. Lunar descent capability highly desirable. Contract value: Accumulative per mission. I could only find one oval-encircled satellite in the image above. The full image ( http://photojournal.jpl.nasa.gov/figures/PIA13110_fig1.jpg ) does indeed show a second satellite in the lower right portion of the image. Definitely a heavily trafficked portion of Auriga when WISE snapped this view. [The Astrophysics Senior Review Committee] said there was not adequate scientific justification to continue the mission. ¶ The proposed additional three months, known as Warm WISE – […] –would have added $6.5 million to the program’s $320 million price tag. Well, Ivan, you are depicting the problem not only of the US, but of (mostly) the whole world. Some things have gone out of proportion and out of control…. Another observatory bites the space dust. First, AFAIK the observatory and its ROI controlled amount of consumables was never constructed to be serviceable or even reparable. Obviously such can have demonstrated benefits (Hubble). But as long as space hardware can’t be the largest, it is doubtful if the technology lifetime is such that it is imperative. It may be better all around to simply launch new observatories that are state of the art yet cheaper, than to run repair and service shops for them. Have there been any models made on this subject, it would be interesting to know about them here. Second, on ROI one can’t have it both ways! If, as I suspect most scientists agree with, it is an appeal to consequences to assert that investment in science hurts a modern economy (so that it hurts other social investment, say), it is an appeal to consequences to claim that sports investment is a problem for society or science. If my math is correct, it works out to about 2% of the orignal budget. I am surprised that this was not budgeted in the first place. After all, if you can continue to do substantial science with only a very small increase in overall cost, then this would add significantly to the over all science value of the project. Maybe it is other factors such as supporting staff or radio downlink limitations? On anothr note, is there a general Q&A section that I could post questions to? I am realtively new and it seems that there are quite a few folks here who follow the space program pretty closely. Click the “Forum” link at the top of the page. This links to the Bad Astronomy/Universe Today (BAUT) Forum. Welcome aboard! This might increase the original budget for such devices, but I should think that cyrogenic systems could be installed if you have sufficient power. If you are cooliing with hydrogen then there is little problem with loss as there is with helium. Helium atoms can sneek through just about anything. Clearly this would increase payload mass and the expense of the spacecraft. Yet if that hurdle can be overcome then WISE would be a gift that keeps on giving. # 3. Warm Spitzer – surprise winner! recommend $7M augmentation for 2012 and 2013, note spacecraft ends operation in Dec 2013 no matter what. Long stares at transiting exoplanets are hot. Oh, and do some extragalactic stuff maybe. # 4. Swift – level funding through 2014, pending future SRC reviews. Good ol’ workhorse. Concern about diminishing returns. # 5. XMM-Newton – ESA mission, cheap, to the US, working well. Try to get some GO funding for US observers. # 6. WMAP – dimishing returns, but 9 yr mission good check on Planck. Level fund and try to get minor augmentation for DA in 2011/2012. # 7. Suzaku – plodding along, JAXA pays, try to get minor augmentation for GO funding in outyears. # 8. GALEX – cut funds in 2011/2012 and close out in 2013. Ouch. # 9. RXTE – spacecraft degradation, could keep it going if there were any money, but there isn’t, so terminate in 2011. Hmm, heard that before, lets see what our friends in Boston have to say about it. # 10. INTEGRAL – ESA is going to extend it, SRC recommends terminate US contribution in 2012. The Q&A section for this topic is here. Each UT topic can be discussed in the forum where you will find lots of friendly space fans and an easy to use edit feature for your convenience. Please have a good look, feel free to join in and enjoy your stay.